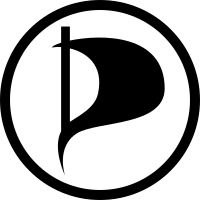 The Pirate Party (Dutch: Piratenpartij, PPNL) is a political party in the Netherlands, formed in 2006 but not officially registered until 10 March 2010. The party is based on the model of the Swedish Pirate Party. On 12 July 2012, the candidate list for the parliamentary elections was announced. The Party leader, Dirk Poot, who two years earlier was 4th place on the list is first on the list, with former leader, Samir Allioui, coming last on the list. The party achieved 0.3%, over 30,000 votes, almost tripling their vote from the last election but failing to meet their target of entering parliament. They also became the largest party not to be represented in parliament. In none of them was it able to win a seat, but on 21 March it was announced that the party won a seat in the Amsterdam West District Committee. The party took part in the parliamentary elections on 15 March. The party leader was Ancilla van de Leest. The party got 0.34% of the votes (35478 votes), but since 0.67% of the votes is required to gain a seat, the party did not enter the Dutch national parliament. ^ Piratenpartij (13 April 2010). "Structuur" [Structure] (in Dutch). Retrieved 14 April 2010. ^ Piratenpartij (13 April 2010). "Kernpunten" [Key Positions] (in Dutch). Retrieved 14 April 2010. ^ NU.nl (12 April 2010). "Piratenpartij wil naar vrije informatiesamenleving" [Pirateparty wants a free information society] (in Dutch). Novum. Retrieved 14 April 2010. ^ NU.nl (18 March 2010). "'Piratenpartij doet mee aan verkiezingen'" ['Pirateparty participates at elections'] (in Dutch). Novum. Retrieved 14 April 2010. ^ Piratenpartij (13 April 2010). "Kandidatenlijst" [List of Candidates] (in Dutch). Retrieved 14 April 2010. ^ Piratenpartij (13 April 2010). "Internationaal" [International] (in Dutch). Retrieved 14 April 2010. ^ Pirate Parties International (30 December 2009). "About PPI". Retrieved 14 April 2010. This page was last edited on 31 August 2018, at 16:00 (UTC).